Latino Boom: An Anthology of U.S. Latino Literature combines an engaging and diverse selection of Latino/a authors with tools for students to read, think, and write critically about these works. 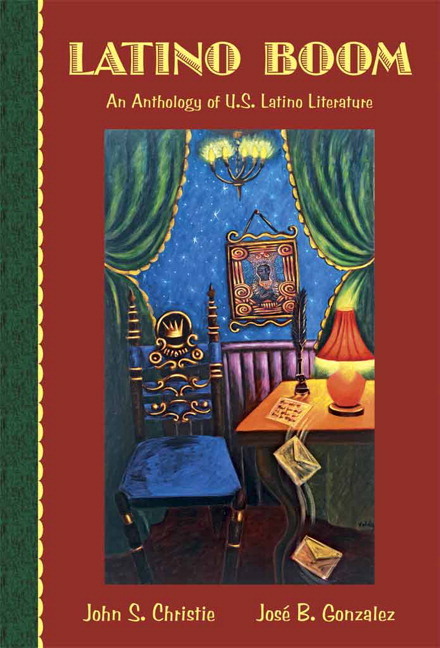 The first anthology of Latino literature to offer teachers and students a wide array of scholarly and pedagogical resources for class discussion and analysis, this thematically organized collection of fiction, poetry, drama, and essay presents a rich spectrum of literary styles. Providing complete works of Latino/a literature vs excerpts written originally in English, the anthology juxtaposes well-known writers with emerging voices from diverse Latino communities, inviting students to examine Latino literature through a variety of lenses. Rich diversity of well-known and emerging, contemporary selections reflects all four genres (fiction, poetry, drama, and essay), offering a variety of themes and styles, and representing a range of ethnic Latino backgrounds and perspectives. Extensive resources place works in historical and literary contexts, including maps and a Latin American/Latino historical timeline. Introductory chapters on Latino narrative and Latino poetry, provide students with helpful background information on each genre. Student-centered apparatus – thematic introductions, essay questions, discussion topics, footnotes for Spanish terms, and bibliographies – spark student engagement, discussion, and writing. Innovative material that relates novels and films to the themes in each chapter: The Novel Connection acquaints students with the expansive body of Latino novels for further study; The Film Connection provides suggestions for and short discussions of films that have thematic links to the literature. * Discussion questions for each work in the anthology. * Summaries of each work that provide cultural and historical perspective. * Helpful links for further study of each work. * Scholarly and informational essays on Latino literature. * Links to author websites. * Other useful online resources for faculty who want to learn more about Latino literature and Latino cultures. I. U.S. LATINO LITERATURE: AN OVERVIEW. Scholarly Publications on Latino Narrative. Latino Poetry as a Protest. The Power of the Smaller Presses. Scholarly Publications on Latino Poetry. Turnabout Map of the Americas. Mexico and the Modern U.S.-Mexico Border. Timeline of Latino Historical and Cultural Events, 1492-2004. Selected Publications in Latino Studies. Selected Publications in Latino History. II. READINGS IN LATINO LITERATURE. 4. The Lost Worlds: Once Upon a Latin Moon. Rudolfo Anaya: “In Search of Epifano”. Daniel Chacón: “Biggest City in the World”. Sandra Cisneros: “One Holy Night”. Antonio Farias: “Red Serpent Ceviche”. Ana Menéndez: “Confusing the Saints”. Victor Hernandez Cruz: “African Things”. Judith Ortiz Cofer: “The Latin Deli: An Ars Poetica”. Aleida Rodríguez “The First Woman”. Richard Rodriguez: “Go North, Young Man”. Resources for Writing and Class Discussion. The Novel Connection (Overview and List of Novelists). 5. The Working World: Sweating Under a New Sun. Norma Cantú: “Se me enchina el cuerpo al oír tu cuento”. Dagoberto Gilb: “Al in Phoenix”. Helena Maria Viramontes: “The Cariboo Café”. Jimmy Santiago Baca: “Work We Hate and Dreams We Love”. Martín Espada: “Who Burns for the Perfection of Paper”. “Jorge the Church Janitor Finally Quits”. Diana Garcia: “When Living Was a Labor Camp Called Montgomery”. Jose B. Gonzalez: “Because No One Should Say ‘Chávez Who?’”. Carolina Hospital: “Blake in the Tropics”. Gary Soto: "The Elements of San Joaquin". Jose Antonio Burciaga: “Pachucos and the Taxi Cab Brigade”. Broader Horizons: Resources for Writing and Class Discussion. The Novel Connection (List of Novelists). 6. The Urban World: Weaving through City Streets. Junot Díaz: “Edison, New Jersey”. Dagoberto Gilb: “Love in L.A.”. Sergio Trancoso: "My Life in the City". Jack Aqüeros: “Psalm for Coquito”. Lorna Dee Cervantes: “Freeway 280”. “Beneath the Shadow of the Freeway”. Victor Hernández Cruz: “Their Poem”. Julio Marzán: “Grand Central Station”. Willie Perdomo: “Reflections of the Metro North, Winter 1990”. Pedro Pietri: “Puerto Rican Obiturary”. Miguel Piñero: “La Bodega Sold Dreams”. “A Lower East Side Poem”. Gloria Vando: “In the Dark Backward”. Josefina Lopez: Real Women Have Curves. Luis Alberto Urrea: “Meet the Satánicos”. 7. The Fringe World: Outside Looking In, Inside Looking Out. Alba Ambert: “Rage of a Fallen Angel”. Daniel Cano: “Somewhere Outside Doc Pho”. Leroy V. Quintana: “The Man on Jesus Street — Dreaming”. Abraham Rodriguez, Jr.: “The Boy Without a Flag” . Edgardo Vega Yunqúe: “The Barbosa Express”. Naomi Ayala: “A Coquí in Nueva York”. Jose B. Gonzalez: “Autobrownography of a New England Latino”. “Caribbean Fresco in New England”. Aurora Levins and Rosario Morales: “Ending Poem”. Alberto Rios: “The Vietnam Wall”. Carmen Tafolla: “Letter to Ti”. Gloria Anzaldúa: “La conciencia de la mestiza: Towards a New Consciousness”. 8. Beyond Worlds: Beyond the Boom. Sandra Benítez: “Fulgencio Llanos: El Fotógrafo”. Lorraine Lopéz: "Soy la Avon Lady". Jaime Manrique: “The Documentary Artist”. Achy Obejas: “We Came All the Way from Cuba so you could Dress Like This?”. Cecile Pineda: “Notes for a Botched Suicide”. Benjamin Alire Sáenz: “Obliterate the Night”. Ana Castillo: “Women are not Roses”. Sandra María Esteves: “Puerto Rican Discovery #11: Samba Rumba Cha-. Julio Marzán: “The Pure Preposition”. Aleida Rodríguez Jr.: “Plein Air”. Tino Villanueva: “Variation on a Theme by Carlos Williams”. “Scene from the Movie Giant”. “At the Holocaust Museum: Washington D.C.”. Judith Ortiz Cofer: “The Story of My Body”.